The March meeting of the Muse and Views Book Club was hosted by Carla and attended by Beth, Shirley, Sharon, Jane and Betty. As the majority of this month’s book, The Piano Maker by Kurt Palka, was set in Canada, Carla chose a selection of local cheeses and sausages. She also offered tastes of grapple, which is described as an apple that tastes like a grape and which is actually an apple that has been infused with artificial grape flavour. Grapple is also described as two species that have no business being together combined to produce something beautiful and odd and which definitely relates to our book. Her wine selection this month was in direct correlation with book scenarios. Not to give too much away, but one of the wines was called D’Ont Poke the Bear and another was Twist of Fate. Carla’s delicious Pavlova and tea completed the evening’s food, wine and discussion. Betty presented this month’s book and provided interesting information about the author. Kurt Palka was born and educated in Austria. He began his working life in Africa where he wrote for the African Mirror and made wildlife films in Kenya and Tanzania. He has worked and written for American and Canadian publications and as a Senior Producer for the CBC. It was while he was living in a rooming house in Johannesburg that Palka first learned about pianos. While travelling the hot, dry back roads of South Africa with a fellow roommate, an itinerant piano tuner, the impression of watching this master at work left a lasting impression on him. Years later Palka was working in France, staying at a pension in Nice where there was a Bösendorfer in the music room, and most evenings it would be played. This time, it was a young woman who came to tune the piano but this time not with tuning forks but with her highly sensitive ear. Set in a fictional town on Nova Scotia’s French Shore in the 1930s, it follows Hélène Giroux, a mysterious French woman with a troubled past. When she arrives in town, she joins the church as a choirmaster and pianist, dazzling the small, insular community with her talent, refined elegance and stories of the piano factory her family owned in prewar France. After the Great War left her both widowed and destitute from the ruin of her family's piano-making business, Hélène had left France for England and, eventually, Québec. A series of weighty, enigmatic references – to a jail, an institution, dreams about an accident in a "cave of horror" – suggest Hélène is trying to escape some kind of trauma in her recent past. 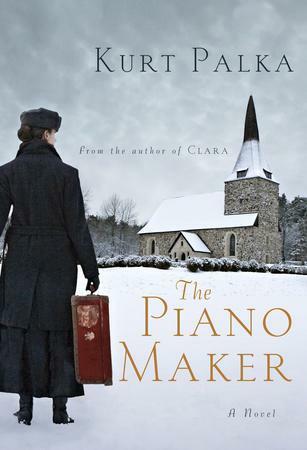 The Piano Maker offers interesting characters and a story that goes from France to Canada, taking detours into Indochina and Africa. It illustrates the development of a piano-making company, the horrors of WWI, the market in the early 20th century for ancient treasures from exotic countries and the harshness of Canadian winters in Western Canada. There is an intrigue and you find yourself rooting for Hélène Giroux. Despite so much going on in the novel, it is not even 300 pages long, it is concise and has little irrelevant descriptions or scenes. It was noted and appreciated that, reminiscent of To Kill a Mockingbird and Snow Falling on Cedars, part of the story was told by the use of a trial. There was a lyricism to the writing with the story being told as an onion being peeled. The discussion of the making of a piano with all the woods used and the processes was an interesting diversion. While the general consensus was that this was an enjoyable, quiet and easy read, there were some distractions. A negative point was made with reference to the priest insisting Hélène go to confession which would definitely not have been done, particularly in that era. There was also a discordant note out of time where Hélène’s daughter who lives in England calls her ‘mother’ and then suddenly it becomes the American ‘mom’. Questions remain. Why would Hélène go off with Nathan after he had bilked her of all her money? Would an unmarried couple travel together easily in that time period?